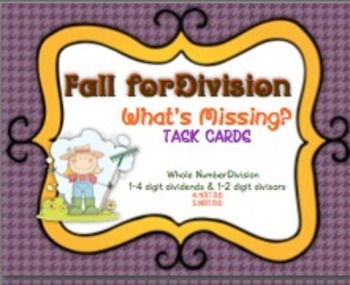 Fall for Division - What is Missing Task Cards are perfect for centers, a game of Scoot, or even small group practice. They also work well for cooperative structures like Quiz/Quiz/Trade, Fan & Pick, Show Down, or Numbered Heads Together. 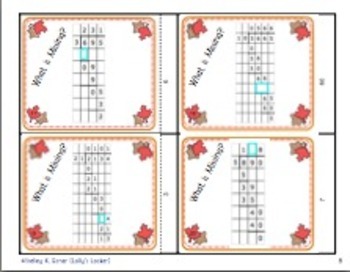 Included are directions and printable parts for a file folder game that will work with most task card sets.This set includes 24 task cards that feature division problems with 1-4 digit dividends and 1-2 digit divisors. For added durability, print on card stock or laminate. 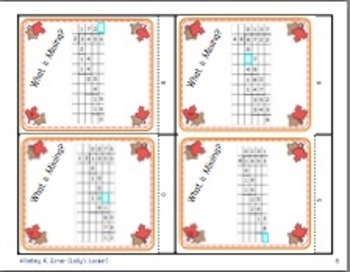 Bonus - Game Board Included - Can be used with any task cards!